According to a Congressionally mandated report by the National Academies of Sciences, Engineering, and Medicine, the concepts behind the Federal Motor Carrier Safety Administration’s (FMCSA) Safety Measurement System (SMS) are sound, but the program is in need of some improvements. The National Academies was instructed in the FAST Act to investigate whether the criticisms of the Compliance, Safety, Accountability (CSA) enforcement model were valid. The report indicates that many facets of the current SMS model appear “reasonable,” but lack the empirical evidence to support the methodology. In other words, the program is being designed and refined as needed based on subject-matter expertise rather than validated scientifically. FMCSA has 120 days to respond to the report and come up with a plan to present to the Department of Transportation’s Office of Inspector General. The agency has been instructed to develop a more statistically principled approach over the next two years based on an item response theory (IRT) model. The IRT model would use a series of yes/no questions and do away with the current time-weighted severity-weight formulas. FMCSA is also instructed to work with states and other agencies to improve the collection of data, specifically vehicle miles traveled and crashes. One suggestion is to track the miles traveled in each state to account for exposure rather than rely on the data currently entered by the motor carrier on its MCS-150. A new source of data might be the miles used by motor carriers for their state’s fuel tax. If the new model is successful in identifying high-risk motor carriers, the National Academies recommends that it replace the current SMS, similar to how the SMS replaced its predecessor, SafeStat. 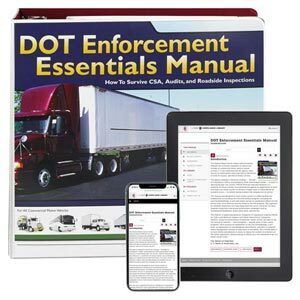 The report recommends that the agency also collect additional data on a motor carrier’s characteristics, such as driver turnover rates, type of cargo, and method and level of compensation. This wage data, for example, is thought to be important because of the correlation between driver pay and crashes. Drivers that receive higher pay (versus miles traveled) are less likely to be in a crash. BASIC scores: public or private? The researchers were unable to offer input into whether a motor carrier’s BASIC scores should be made public. They are not currently available to anyone outside of the motor carrier and enforcement. To make a recommendation requires delving into the consequences of public knowledge of the information, the report says.